Easy Mozzarella Chicken is a low carb dream! Seasoned chicken simmered in a homemade tomato sauce and topped with melted mozzarella cheese. 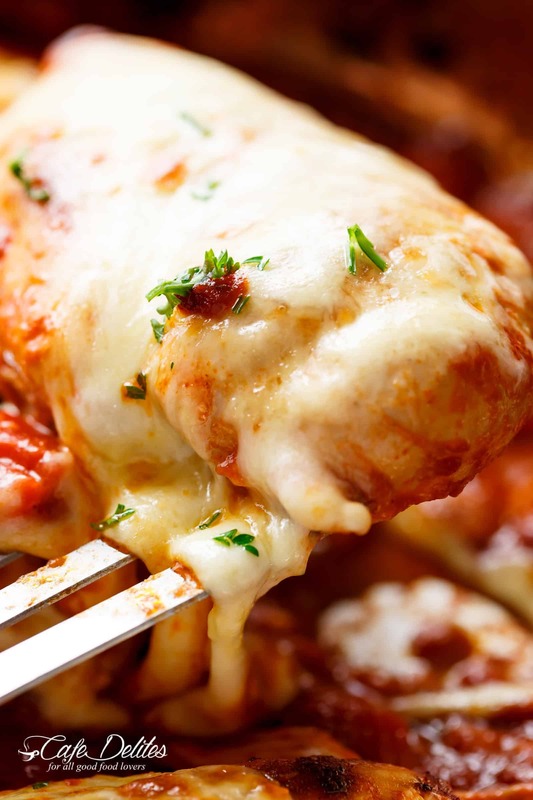 The BEST Easy Mozzarella Chicken recipe that happens to be exactly what it claims to be… EASY! A 20-minute Low Carb Chicken Parmesan WITH NO BREADING! You don’t even MISS a crispy crumb on this chicken…it is SO good! A step up from my original Mozzarella Chicken with a 3-ingredient sauce , this one is ten times better. It’s all about the homemade tomato sauce filled with so much flavour! Unlike my original recipe of using jarred pasta or marinara sauce on a rushing-to-get-dinner-on-the-table kind of day, this recipe uses a tomato sauce made from scratch. We are only adding 5 extra minutes of cooking time in this recipe, and honestly, it’s well worth it when you get a beautiful, rich sauce soaking into your chicken breasts to make them that much more succulent and tasty. 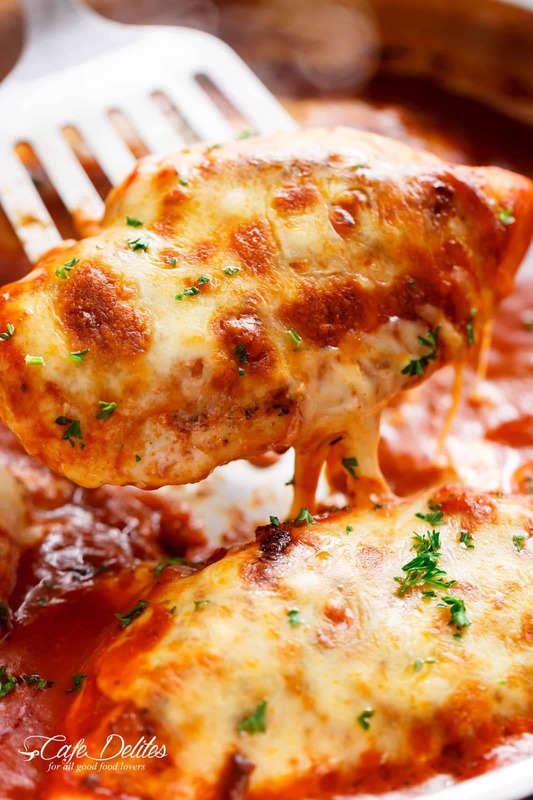 You are 5 simple steps away form the BEST Mozzarella Chicken! The secret totally lies in the 5 major ingredients in this sauce. So much better than store bought stuff! Tomato paste — I use garlic and herb flavoured. Don’t skip this, it makes your sauce nice and thick. The recipe includes broiling the cheese at the end for a nice crisp, golden and bubbling cheese result. If you don’t want to turn on your oven, you can throw a lid on your pan and allow the cheese to melt that way while simmering on the stove. I prefer broiling (our grilling for Aussies), because you can’t beat the result crispy melted mozzarella cheese! Easy Mozzarella Chicken is a low carb dream! 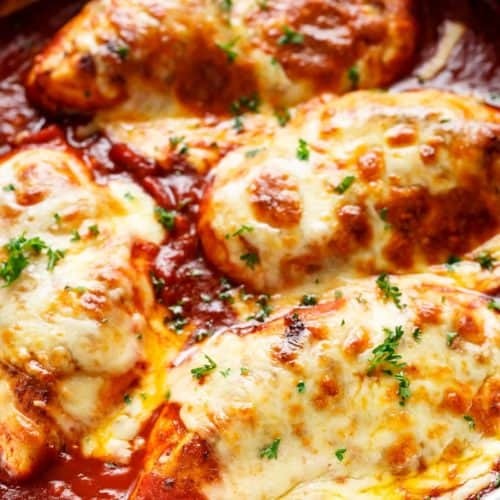 Seasoned chicken simmered in a homemade tomato sauce, topped with melted mozzarella cheese! A 20-minute Low Carb Chicken Parmesan WITH NO BREADING! You don't even MISS a crispy crumb on this chicken. It is SO good! Arrange oven shelf to the middle of the oven. Preheat broiler (or grill in Australia) on medium heat. Season chicken with 2 teaspoons of Italian seasoning, paprika, onion powder, salt and pepper. Heat oil in a pan or skillet over medium heat. Cook chicken on both sides until browned and cooked through (about 8 minutes each side). Transfer to a plate; set aside. Cook the onion in the same pan until transparent (about 3-4 minutes) scraping any browned bits form the bottom of the pan, then add in the garlic and cook until fragrant (about 1 minute). Add the fire roasted pepper (or capsicum), crushed tomatoes, tomato paste, crushed red pepper flakes (if including) and remaining Italian seasoning. Give it a good stir to mix well. Bring to a simmer and allow the sauce to thicken while stirring occasionally (about 4 minutes). 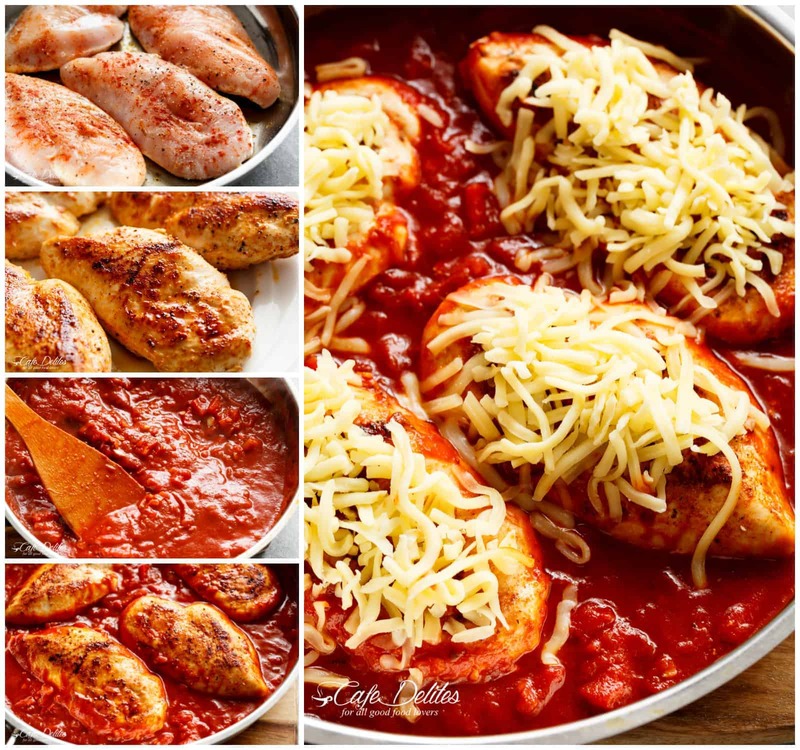 Arrange the chicken in the sauce and top each breast with 2-3 tablespoons of mozzarella cheese per breast. Transfer to the oven to broil for 1-2 minutes, or until the cheese in browned and bubbling. Anyone know exactly how many carbs this has? Please refer to the nutrition information located in the recipe box. 9 carbs. This recipe was a hit! No leftovers what so ever. Will definitely be making again! I plan on making this recipe on the weekend but I do not know what ‘1 fire roasted pepper, chopped’ is. I am in the US, could you explain what that is? Thank you! I know this is a year later but you can buy them in a jar/can. My grocery has a few different flavors, usually by the pickles and such. Made this myself last night, no leftovers! Really didn’t make enough as everyone in the house ate it! Made as directed. It was so good. I served it with angel hair pasta. There was plenty of sauce. I look forward to making more of your recipes. Thank you! I just made this for dinner. It was great and i will be making it again. So good i think I’ll post it to my Facebook. I made this for dinner tonight. All I changed was to cut up my chicken in chunks. I don’t know what a fire roasted pepper is so I just bought a jar of roasted red peppers. I doubled the sauce ingredients because I could only find a large can of crushed tomatoes. Then I mixed in a small spaghetti squash. It was amazing and my husband (who has been crabby because of our journey into healthy eating) loved it. I will never buy jarred sauce again. 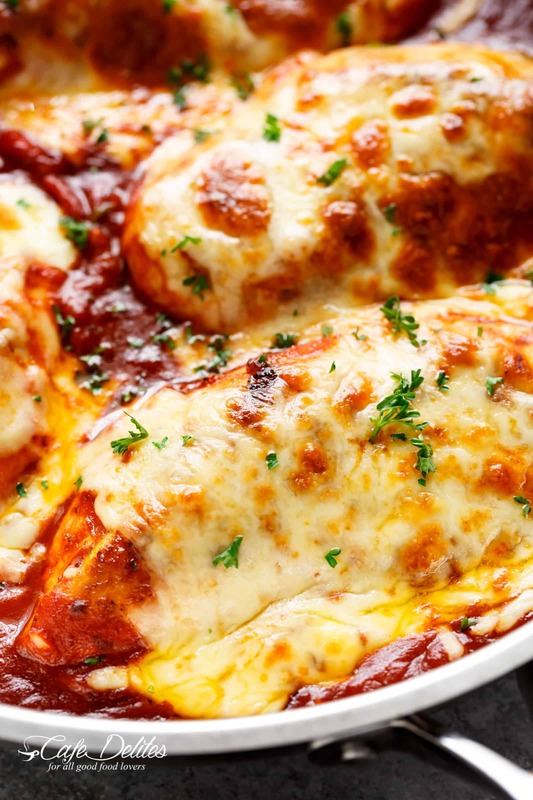 Chicken cooked perfectly, delicious sauce that doesn’t just taste like tomatoes, and plenty of delicious cheese! This one is going in the rotation for sure! I only have roasted red peppers in a jar… How much should I use? Do I drain them? That sounds great! I would drain them and if they are large I would cut them up, otherwise throw them in the pan! How yummy! Enjoy! Hi Karina! This is THE BEST RECIPE EVER!? I am so excited to eat probably to excited that I don’t even want to wait for my family to get home to eat. I am soooo proud of myself and you have given me the confidence to cook again of course with the help of your recipes. The recipe was so easy to follow. 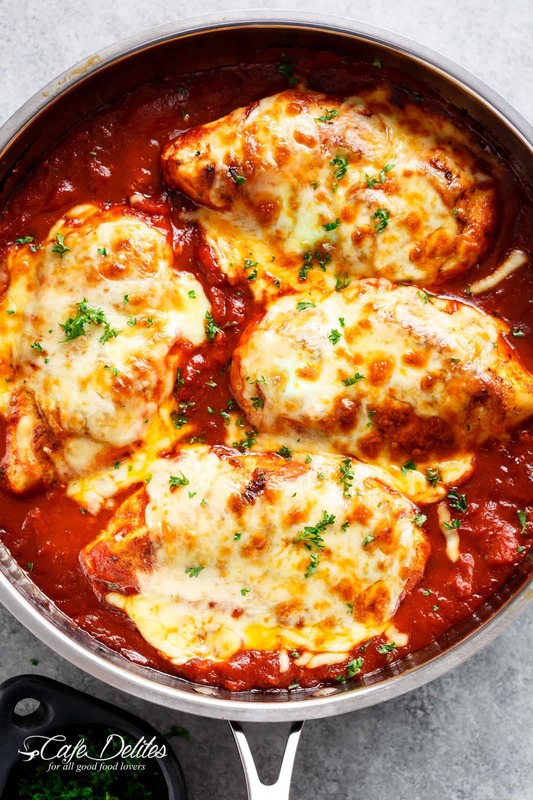 Easy mozzarella chicken…mmm mmm good! You are the best! Thank you! That is so great to hear! Thank you so much for sharing with me and following along with me! I am so proud of you too and I hope you are able to find more recipes that you love on my site! Thanks so much! That is great! Congratulations on starting your own restaurant! I hope everything goes well for you. Don’t forget to give credit to those recipes that you are using though;)!! I tried two of your dinners and they came out very delicious. If subistuting tbe fire roasted pepper for roasted peppers in oil , how much to use ? Hi Karina! This Mozzarella Chicken is making my mouth water! It sure looks & sounds delicious, and I can’t wait to fix it!! I was wondering about the Chicken. Do you both broil and pan fry it? Step 2) “Season chicken with 2 teaspoons of Italian seasoning, paprika, onion powder, salt and pepper. Cook 8 minutes, then flip and season other side. Step 3) Heat oil in a pan or skillet over medium heat. Cook chicken on both sides until browned and cooked through (about 8 minutes each side). Transfer to a plate; set aside.” Thanks for sharing your recipe 🙂 Love your Blog!